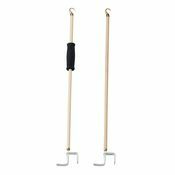 Lightweight reacher/dressing stick features a small C-hook at one end and a large, plastic-coated push/pull hook at the other. Weighs less than 5 oz. Shaft measures 26″ long.